A praise-worthy fuzz pedal? Amen. Like fearsome fuzz from the top of Mount Olympus. Great if you enjoy unwieldy fuzz tones. Fun features. Takes a bit of dialling in. 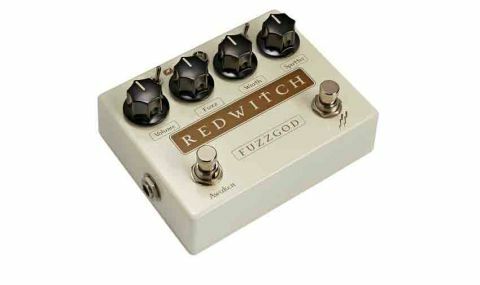 Featuring silicon transistors, the New Zealand-built Fuzz God II sports two footswitches: a normal bypass and one designed to "incur the wrath of the Fuzz God," says Red Witch, unleashing oscillation and octave effects governed by the wrath knob. "A sputter knob dials in a sweet spot for descents into dying battery weirdness"
Volume and fuzz controls are standard, while a sputter knob dials in a sweet spot for descents into dying battery weirdness. On top of that, you get toggle switches to double the gain and bring in a treble boost. While you encounter thick and musical character fuzz with the sputter knob fully clockwise, going backwards makes things more ragged, as the fuzz hangs on for dear life. The second footswitch brings in sonic chaos that you can leave running to ensure you get an encore ( just so it gets turned off!). If you like the madness of the ZVex Fuzz Factory, the Fuzz God II will appeal. Lining up your knobs is crucial, as there's so much interaction, but get them right and satisfaction is guaranteed.